Introducing Grinder Press: With its fine collection of 49 handsomely worn textures and old school effects, Grinder is a sturdy smart press that transforms your design into hammered pieces of old grunge & vintage lines instantly – all done conveniently in one smart .PSD! 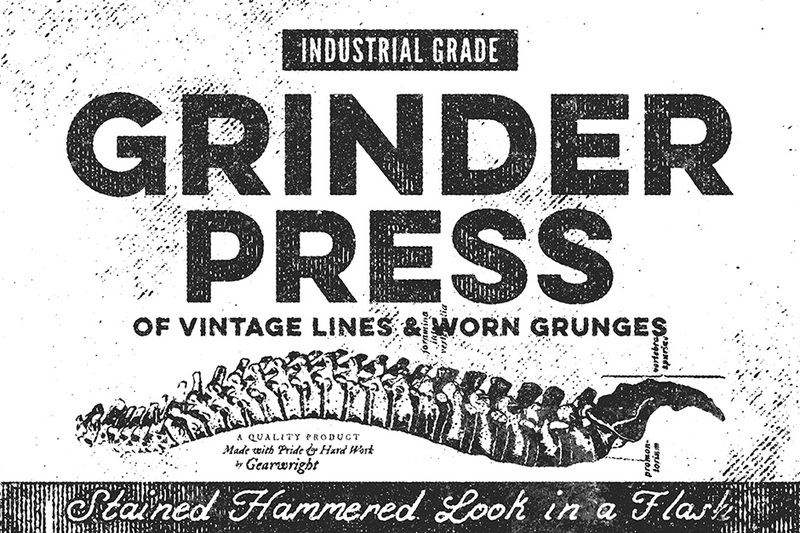 • Grinder Press .PSD (3000x2000px 300PPI): The .PSD which turns your flat design into an industrial vintage look as advertised in previews. Drop your design inside Smart Object and save, Grinder will finish them with broken lines and dirty grunge in a flash. • A designed built-in template (editable) to help you jumpstart the Grinder straightaway. All fonts (free) information are included in Read Me Notes .PDF. • 49 handcrafted stained texture (3000x2000px 300PPI) readily set in Grinder Press in total for your customization purpose. Lines include vertical, horizontal, and diagonal to give your design a distinct impression. • My textures are organic and authentic; they are of high quality, do not tile and never repeat & always freshly made! I never duplicate or adapt texture from/ to other products. You can sit back and relax when you buy from us. File size is approx 352.1MB (536.4MB unzipped), offered as a single download.